Does the Bet Doubling Strategy Work? People have tried doubling their bets since the early origins of the Martingale betting system in the belief that it would result in a sure thing. Many gamblers still swear by this method and use it in casino games such as roulette. But does the bet doubling strategy work in reality? This article takes a look at this gambler's strategy that, while sound in its mathematical accuracy is seriously flawed in its expectations. Originating in France in the 18th century, this most simple of martingale strategies quickly caught on when some gamblers reported using it to great effect. The strategy was originally designed for the kind of games where there is an approximate 50/50 chance of inning, as in the case of flipping a coin. 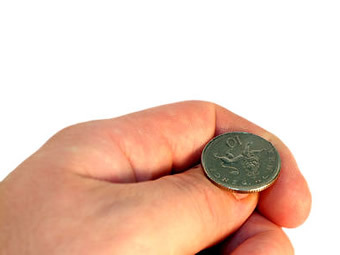 Statistically, repeatedly flipping a coin will eventually result in an even number of "heads" and "tails" being flipped. The strategy is that by always betting on one side coming up, for example "heads" and doubling the bet after each subsequent show of "tails", when "heads" comes up, mathematically you will win all your money back including your original stake. There is one major flaw in this calculation that many erroneously believe is a gambling rule. That is that there is no set limit to how many times "tails" will come up before a "heads". While it is unlikely that "tails" will be repeatedly flipped more than ten times, it can and does happen. If you wanted to continue at this point, it starts to get very expensive. Bet 11 would cost you £10,240. Bet 12 would cost you £20,480. If "tails" continues to come up the next bet (13) would cost you £40,960. Most gamblers would be broke by this time but if you had a very large cache of funds, you could go again for the 14th time and bet £81,920. If that bet lost but you were determined to continue, you would probably be looking at potentially losing your house, your car and probably your business too if "heads" continued to fail to show. The same thing can happen in roulette or any other game of chance that gives approximately 50/50 odds (red/black, odds/evens, high/low in roulette). People seem to be under the false belief that if red comes up then statistically the next ball should land on a black number. This is a fallacy! On any game of pure chance such as roulette, the result of each spin of the wheel is totally independent of the previous spin. So theoretically, you could be standing at a table that resulted in any number of consecutive reds. If you were employing a Martingale betting system and this happened, you would soon be bankrupt! There is an anti-martingale betting system that changes the pattern so that a bettor doubles his bets after each win, while halving his bets after each loss. The philosophy behind this approach is that a winning streak is rewarded with greater winnings, while a losing streak minimizes the player's losses. The truth is that in all cases of betting on a game of chance, there is no infallible gambling system or betting formula that will help a gambler to gain an edge. This is simply because the winning odds of a round cannot be affected in any way by the outcome of the previous round. If you want to see how it happens, but you're affraid of losing any money, a good place to try would be here: (read my Foxy Casino review to see). They have a great welcome bonus offer which lets you have, you guessed it free money for more bets!